Humidifiers are amazing little devices that add moisture to any room and in places deprived of humidity. If you struggle with allergies, sinus problems or dry skin because of dry climate conditions then here’s everything you need to know about humidifiers and why you should get one! As the name suggests, humidifiers increase the humidity or moisture in the air. And for places with dry weather conditions, humidifiers are just perfect. For people dealing with seasonal allergies, dry throat, sinus problems and nosebleeds these devices provide instant relief. Apart from allergies, your skin feels better too and it even gets rids of frizzy hair. However, one question that you’ll soon be asking is- Should I go for a warm or cool mist humidifier? Difference between warm and cool mist humidifiers! Warm mist humidifiers are also known as vaporizers and release a warm mist into the air by heating water within. It is preferred for those dealing with congestion and you can even add some medicated inhalant to the water to get some relief. However, these humidifiers work best in smaller places. They are slightly more expensive than cool mist humidifiers and also use more energy. Cool mist humidifiers, on the other hand, create water droplets that are released in the form of a cool fog using ultrasonic technology. They are great for all spaces and have a really good water capacity. If you’re not too fond of warm and steamy mists then this is definitely the one for you! Finding a good humidifier is crucial with many things to keep in mind. And if you’ve decided on cool mist over warm mist then you’ll definitely love 1byone’s Ultrasonic Cool Mist Humidifier with an amazing capacity of 6 liters! 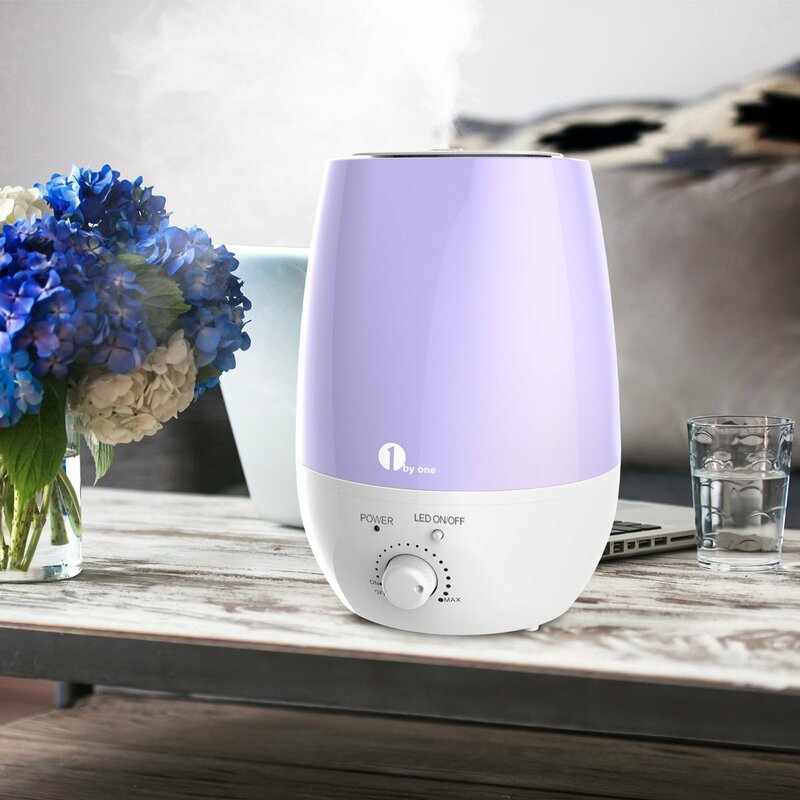 What makes 1byone’s Cool Mist Humidifier different from all others is that it not only does the job of a humidifier but also lets you add your favorite aroma fragrances so your room smells heavenly and relaxing. 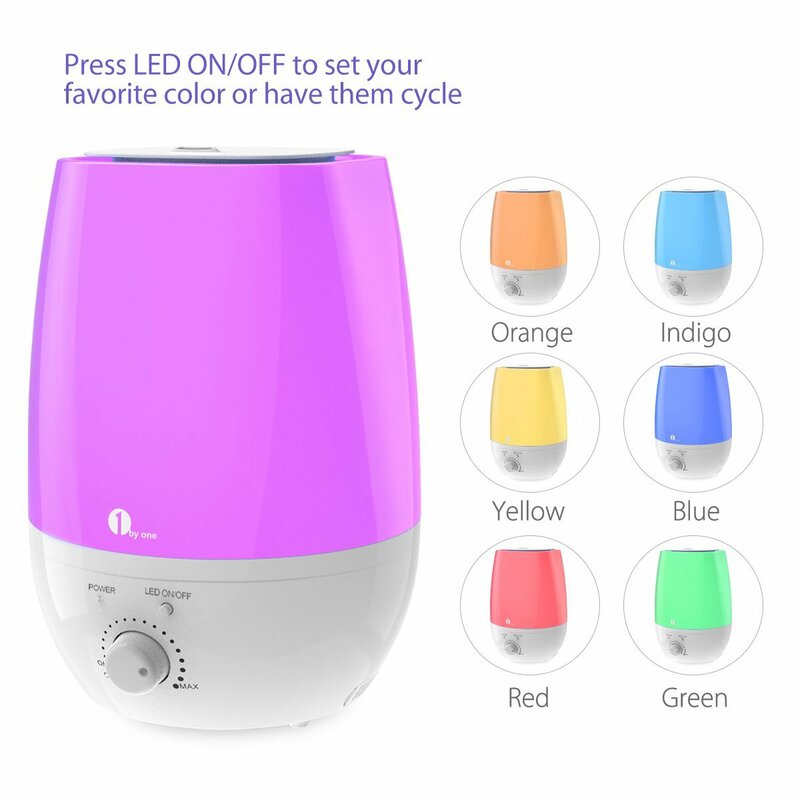 Not all humidifiers that run with water let you add aroma oils to them so this one’s a keeper! Not just functional, this humidifier is also aesthetic! It has cool LED lights with 7 vibrant colors to choose from. Or you can just leave it in the auto mode which changes the colors automatically for you. The humidifier is very silent and operates up to 20 hours so you can leave it on before going to bed and wake up feeling refreshed. It has a mist nozzle that rotates 360 degrees so you can send the mist any direction you choose! There is an automatic shut off when the water level is low and the tank holds 6 liters of water. 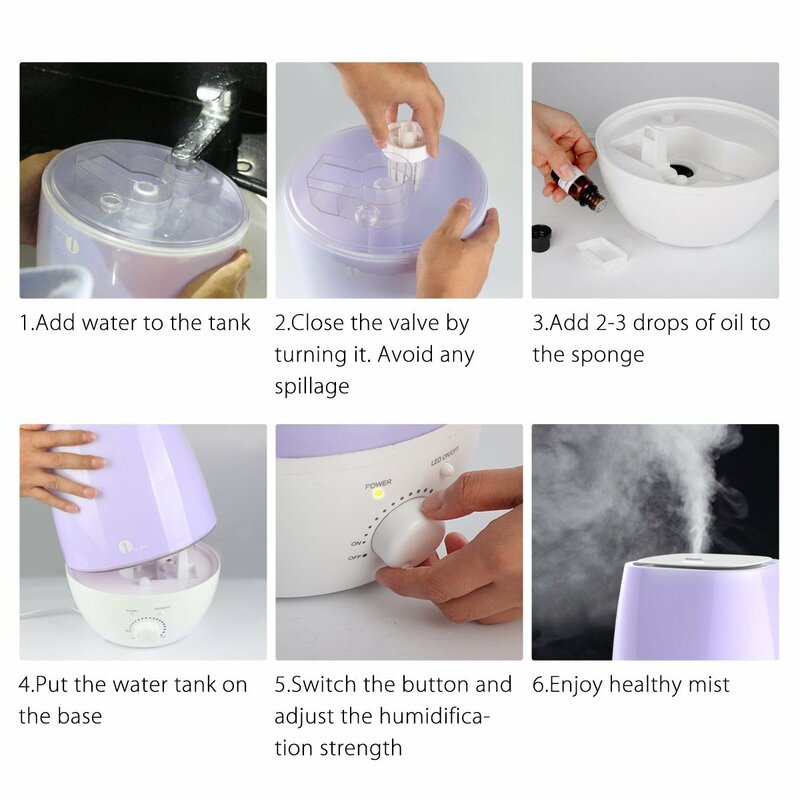 Never used a humidifier before? It’s nothing too complex, so don’t worry. You simply have to fill up the water tank with clean distilled water. It also includes a water filter so you know that the mist eliminating is as healthy as can be! And for adding your favorite scents, take the diffuser tray and pour in your aroma oil. 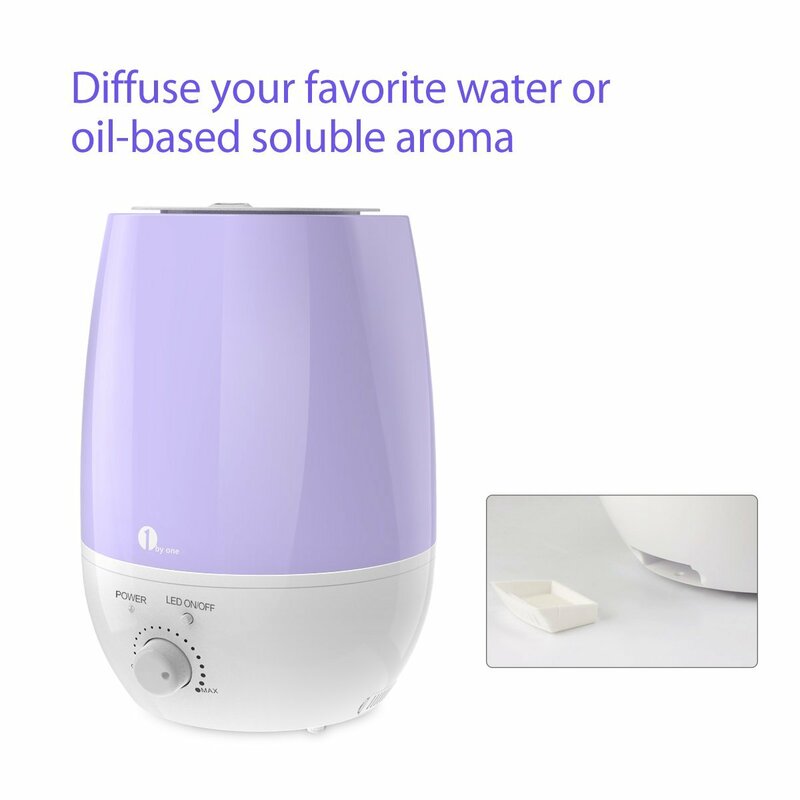 Since the aroma diffuser slot is separate from the water tank so you can easily change from aromas or go back to the regular cool mist without trouble. There is a min/max speed dial on the front with which you can control the flow of the mist as well as on/off for the LED lights! So breathe better and get yourself your very own humidifier at an affordable price of $37.99 at Amazon.